Specially designed to sit on narrow insert ledges. Patented design gives full-time performance in half the space. Only 4” deep, yet holds over 2 quarts of water. Will Never Rust or Corrode (Unlike cheaper cast iron.) 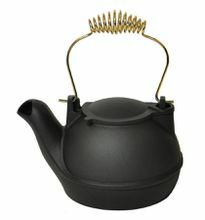 Available in Matte Black Finish with Brass or Chrome Handle or Silver Finish with Chrome Handle. Attractively packaged in a sturdy gift box.